Can’t we just make it go away? I’ve been selling for 25 years and I don’t know exactly when ‘Zestimates’ came out, but when it did, everybody was on it! Now its a part of society, its YUUUGE! (in the voice of Donald Trump). Every homeowner who talks to me about the value of their property has been to Zillow and have their ‘Zestimate’ memorized. In fact I usually bring it up right out of the gate to see what they say, and they pretty much always know their “Zestimate”. Watch me explain it all in the quick video below. Here’s a funny thing that recently hit the news. The CEO of Zillow, Spencer Rascoff, put his house up for sale just recently. Guess what that means? We got to see how close the ‘Zestimate’ for his home was compared to the actual sales price. As you know, you can easily head over to Zillow and enter your address, your mom’s address, or your boss’s address and you can see a ‘Zestimate’ for the property in seconds. 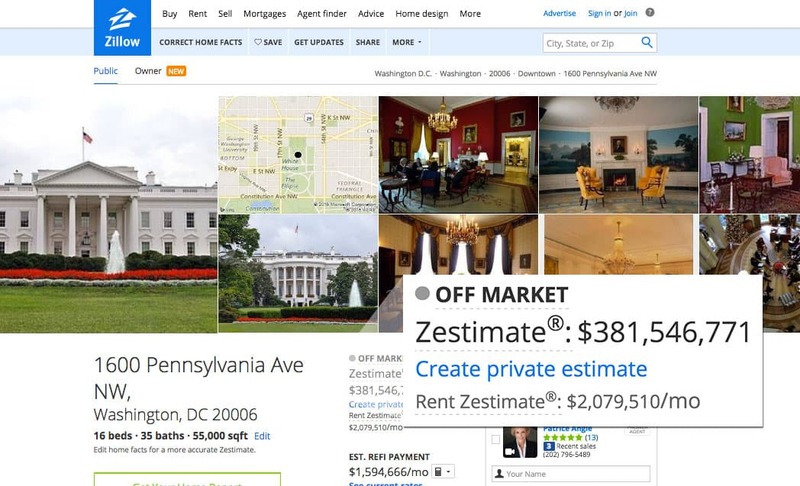 Heck, even the WHITE HOUSE has a Zestimate! So you better believe the media grabbed Rascoff’s ‘Zestimate’ off the website before it sold. 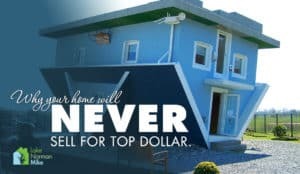 Depending on which news source you ask, The ‘Zestimate’ value of his home was between $300,000 and $500,000 higher than the actual sales price of $1.05 million! This is a major Zesti-MISS! When REALTORS® talk to homeowners about where to set the asking price, the ‘Zestimate’ can really create an uphill battle for us when it’s valued much higher than a more accurate personalized evaluation. So what do real estate agents do to combat the Zestimate? Most top-producing agents actually pay for a service on their website that acts much like what Zilllow offers. You can get a ‘guesstimate” in a matter of seconds! In fact here at Lake Norman Mike, we offer this very thing! Check it out here. Is it accurate, though? I’m afraid not. A computer programmed algorithm cannot do things like assess if a home is on or off the water, or has a large view of the water and what part of the lake is actually in view. It can’t possibly tell if the interior is severely outdated. Can it answer questions like: Is the roof in bad shape? Does the property back up to a busy intersection or an active rail road? How’s the curb appeal? Can a computer model assess all the features of a home in order to provide a truly accurate value? Clearly, No. If it could, then CEO Spencer Rascoff should be very angry for getting much less for his home than the Zestimate value. Are Zestimates ever accurate? Even broken clocks are accurate two times a day! But in all seriousness, it can be fairly accurate in certain situations. The place it works best is in high density neighborhoods where homes are very similar and the turnover rate is high. The computer model in that area doesn’t have to go out very far to get recently sold homes that are very similar to the home being valued. But in the majority of the population especially in homes in the Lake Norman area, the value is NOT going to be trustworthy. Here’s My Conclusion About Zestimates. 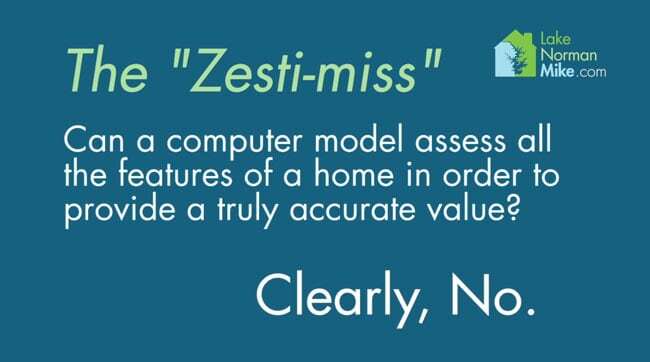 When you are ready to sell your home, don’t rely on ‘Zestimates’ for an accurate estimation. Instead, ask an experienced REALTOR® for a personalized evaluation. Secondly, trust the Realtor® to give you a good estimate as compared with a computer generated estimate. 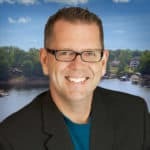 If you want, ask the agent how they came up with the estimation and they can explain what a CMA (Comparable Market Analysis) is and the other variables that were taken into consideration. 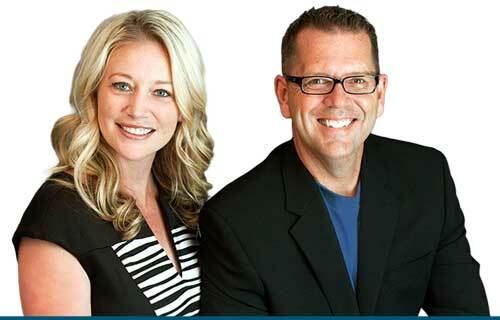 Next week we’ll talk about the question: “Should I get a home inspection before I list my home?” Is it of value? Worth doing? Tune in to see! I’ll continue to ‘shoot it straight’ and answer your questions no matter how controversial they may be. Just send me an email at mike@lakenormanmike.com or text/call us at (704)584-9781. If you want more of these types of videos, subscribe below and I will make sure you get to be first to watch my brutally honest commentary on real estate. Shooting it straight with positively no baloney! Yes, also send me monthly neighborhood specific market updates. No thanks, just the video series.